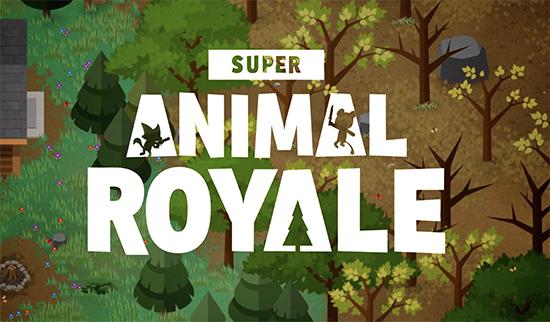 Super Animal Royale, a top-down multiplayer survival shooter for up to sixty-four adorably murderous Super Animals. Engineered to charm and trained to kill, Super Animals are cute enough to make you go “Aww” and deadly enough to make you go “Ahhhh!” Select your favourite from a menu of foxes, pandas, kitty cats, and other bloodthirsty beasts. Parachute into the ruins of an ill-fated safari park and fight off a lethal barrage of bullets, explosives, and silly dancing. Enjoy carefully balanced run and gun gameplay combined with an intuitive fog of war system that restricts a player’s view to line of sight, allowing for sneaky, strategic play. Explore a beautiful 2D world, inspired by classic top-down adventure games. Cut tall grass and loot abandoned structures in search of the guns, explosives and health juice you’ll need to reach the top of the food chain. Players can pre-order the game for $14.99 or play for free in the Alpha by signing up at AnimalRoyale.com; a regular timetable of games will run from now to October when the game will arrive on Steam Early Access for PC Mac.